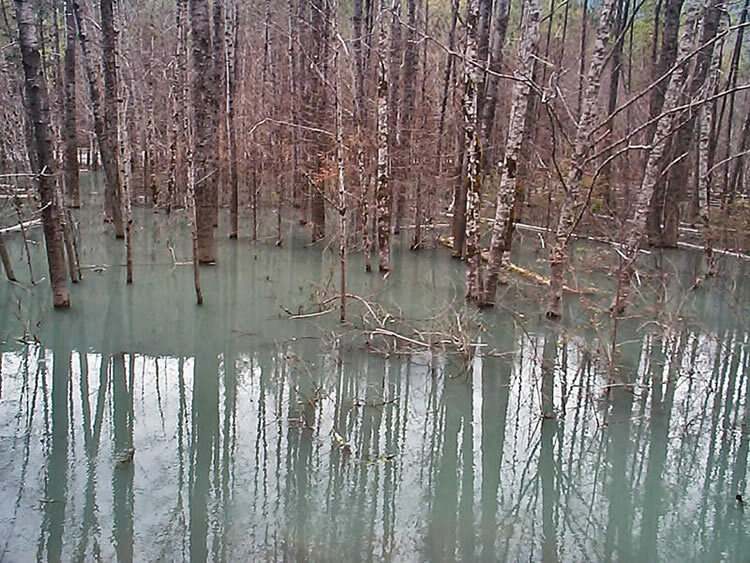 Stands of small trees killed by flooding on June 8, 2002, look like this on July 4, 2004. This photo was taken quite near the new forest service road, upstream from the avalanche site. To see the top of the slide, about 4.5 km (2.8 miles) and 1,250 vertical metres (4,101 vertical feet) above the Copper River Valley, open the link to Natural Resources Canada, below. Photo: Upper Avalanche area Zymoetz: Natural Resources Canada. To return to see the rest of this album, the lower Copper River on beautiful sunny days in 2005, click the "back" arrow at the top of your browser on the Resources Canada page. Photo © Elaine Fleischmann.